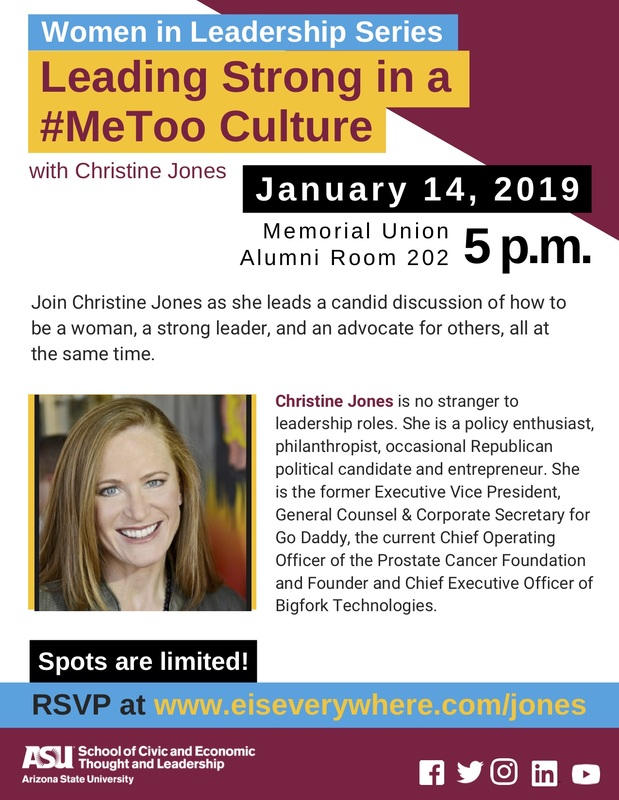 Join Christine Jones as she leads a candid discussion on how to be a woman, a strong leader, and an advocate for others, all at the same time. Christine Jones is the former executive vice president, general counsel and corporate secretary for Go Daddy, and the current chief operating officer of the Prostate Cancer Foundation, the world’s leading philanthropic organization dedicated to the research and eradication of prostate cancer. Jones is also the founder and chief executive officer of Bigfork Technologies, a legal tech company specializing in fully customizable cloud-based solutions for legal departments. Prior to Go Daddy, Jones worked for a Phoenix law firm and the Los Angeles County District Attorney's Office. Jones is an adjunct professor of law at the Sandra Day O'Connor College of Law at ASU, and has been a guest lecturer at a variety of law schools, graduate business schools, colleges and universities, and high schools, including Stanford University, The University of Virginia, Arizona State University, Santa Clara University, Whittier Law School, and many others. She is a published author and served as editor-in-chief of the Whittier Law Review. She resides in Phoenix with her husband, Gary Jones, a retired Air Force officer who runs the AFJROTC program at a local high school. Jones is a policy enthusiast, philanthropist, occasional Republican political candidate and entrepreneur. She is always looking for a way to serve.